This product is simply glorious. I use it on every one of my clients, as well as keep a spare in my purse for myself! MAC describes it as "An aqua-spritz of vitamin and minerals, infused with a calm-the-skin blend of green tea, chamomile, cucumber, topped off with the fresh, natural, energizing scent of Sugi. Adds radiance, finishes makeup. Spray it on. Skin drinks it up!" It is definitely a must have. I love to apply it before makeup, to give the skin some extra moisture and glow. Then, after applying makeup I ALWAYS finish with a few sprays to set the makeup. 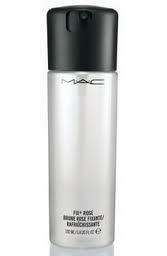 It also works great to spray your brush when using MAC Pigments to get really intense colors. I am amazed at how much longer my makeup lasts when using this product. It also feels AMAZING, and as my summer brides will tell you, it is a refreshing lifesaver when you are sweating to death! My family always makes fun of me because throughout the day I am always pulling it out of my purse and spritzing myself! Want one? Head on over to my Facebook Page by clicking HERE and click LIKE! I will be giving one away tomorrow night!! If you don't have facebook, leave a comment below to be entered into the drawing!! I don't have FB but I want to enter! !